The Expiration action applies to the current object version and instead of deleting the current object version, Amazon S3 retains the current version as a noncurrent version by adding a delete marker, which then becomes the current version. The NoncurrentVersionExpiration action applies to noncurrent object versions, and Amazon S3 permanently removes these object versions. You cannot recover permanently removed objects. For more information, see Object Lifecycle Management. When versioning is enabled, a simple DELETE cannot permanently delete an object. Instead, Amazon S3 inserts a delete marker in the bucket, and that marker becomes the current version of the object with a new ID. When you try to GET an object whose current version is a delete marker, Amazon S3 behaves as though the object has been deleted (even though it has not been erased) and returns a 404 error. The following figure shows that a simple DELETE does not actually remove the specified object. Instead, Amazon S3 inserts a delete marker. 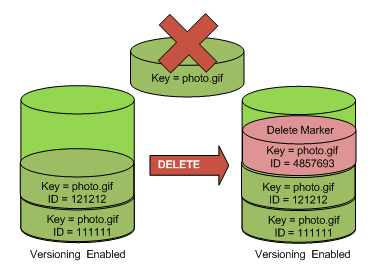 To permanently delete versioned objects, you must use DELETE Object versionId. The following figure shows that deleting a specified object version permanently removes that object. For instructions see, How Do I See the Versions of an S3 Object? in the Amazon Simple Storage Service Console User Guide. For examples of uploading objects using the AWS SDKs for Java, .NET, and PHP, see Deleting Objects. The examples for uploading objects in nonversioned and versioning-enabled buckets are the same, although in the case of versioning-enabled buckets, Amazon S3 assigns a version number. Otherwise, the version number is null. For information about using other AWS SDKs, see Sample Code and Libraries. In a DELETE, specify a version ID. 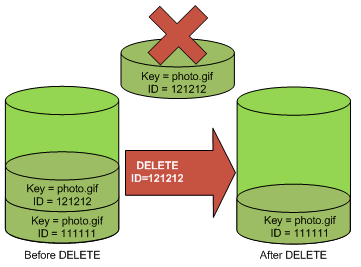 The following example shows how to delete version UIORUnfnd89493jJFJ of photo.gif.